Uglyworld #268 - Lasagne Feast for Ice-Bat (3/365), originally uploaded by www.bazpics.com. 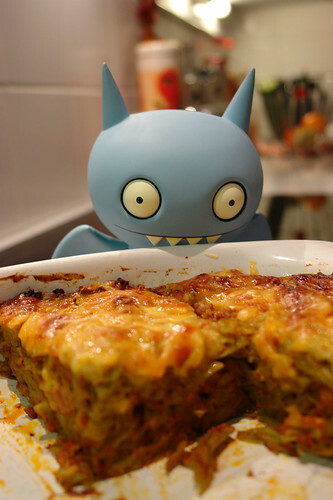 Tonight we paid a visit to Mireille's mum and dad for dinner as I need to drive to Freiburg tonight (Sunday evening), and Ice-Bat was over the moon to find out that we had brought him back some Lasagne (he seems to go mental on the stuff - he says it gives him extra flying power). Uglyworld #317 - Hold Him Still!!! Uglyworld #314 - Has He Gone Yet? Uglyworld #296 - I Can't Find The Car! Uglyworld #276 - "Drive Us Now - Or Else!!!"